Your parents probably told you not to play with your food. That’s sound advice for most people (especially if you’d like to eat in public without drawing stares). Thankfully, artist and photographer Sarah Rosado didn’t listen to her parents when they told her that food wasn’t meant to be played with. Instead of leaving her breakfast alone, she decided to honor some of her favorite celebrities by creating cereal portraits of them. You might not believe just now impressive these are. Sarah was inspired one morning while she was listening to music and eating breakfast. Each of these detailed portraits takes about 5 hours to make. First, she sketches out the celebrity. Then, she crushes the cornflakes into various shapes and sizes. She uses a pin to carefully shape the smaller areas, like the nose and mouth. There’s a new breakfast-themed art in town. Sarah is a self-taught artist that has sought to challenge herself. 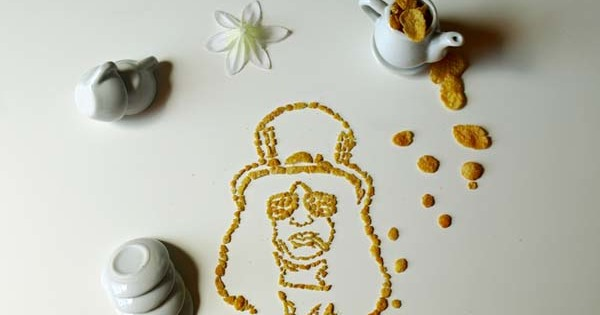 This cereal art is just another avenue that she can conquer. If you’d like to see more of this New York artist’s work, check out her web page. Or, you can follow her on Instagram. She does so much more than just playing with her food (but that has to be my favorite project).